I don't have a dog, but we do love our kitty. 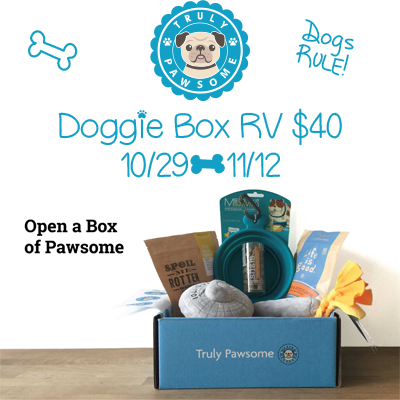 But if you have a pup of your own, this giveaway is perfect for you. Truly Pawsome is inspired by their senior pug, Pork Chop. Wanting to give him the best of everything led them to create specially curated boxes that everyone will love. Pork Chop and his little brother Murray are chief taste testers and approve all treats and toys before they send them out. They both demand the very best and they wouldn't offer them (or anyone else) any less! The Truly Pawsome team is also dedicated to making all dogs happy and they pledge to donate 10% of all purchased subscriptions to rescues and shelters as they want to help all dogs find their forever home.